We’ve been laying low over January, recovering from our Christmas jaunts and mapping out our “should we go there” list as we round into the last leg of our time here. 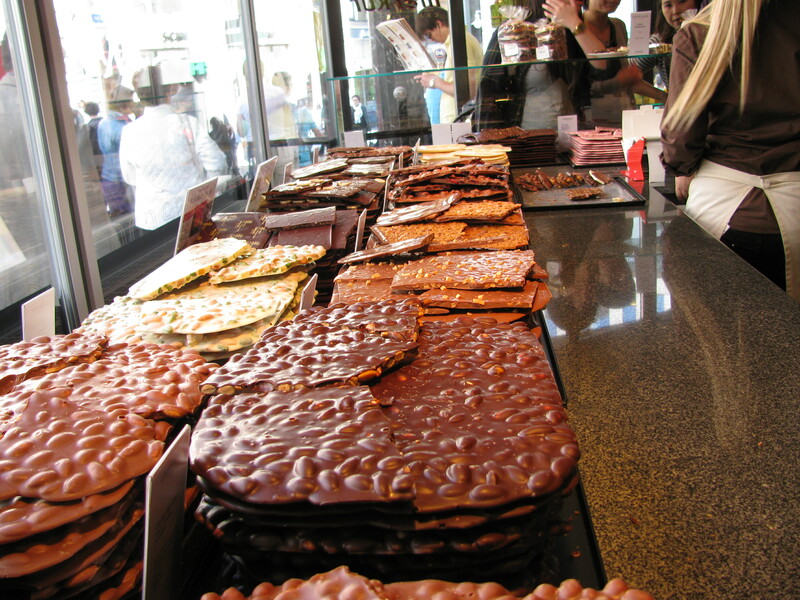 In the meantime, I am discovering more wonderful things about the Swiss that I would never have guessed from afar. For one thing: They are not as worried bout natural gas explosions as are Canadians. I know this for a fact. When I was a reporter, any sign of a natural gas leak brought out the police and fire departments who would evacuate entire city blocks rather than deal with flying body parts should the leak turn lethal. Not so with the Swiss. Walking down one of our town’s beautiful canal strolls, I saw police cars and other emergency vehicles arrive at a building. I say “arrive,” because to suggest they sped up and raced from their vehicles would just not be true. The officers and emergency workers strolled up a building that had several windows open. There were no signs of smoke, fire, or rabid protesters, so I thought maybe it was just a training exercise. Then I walked past the vehicles and noticed several with the word “gas” on their sides. Sure enough, a few feet past the building I caught my first whiff of natural gas in the air. I turned back to see how the emergency workers were doing, and they were busy scratching their heads, which is maybe how they signal to the population to “be calm.” I just hoped no one decided to light up a cigarette (this country is packed with smokers). Pass me a wrench, wilya? I went my merry way, walking faster than I normally do until I reached the distance I estimated Victoria police would have cordoned off, and then I relaxed and waited for the boom. It didn’t come, which goes to show that sometimes everything works out just fine. Later, I checked out the site and discovered a giant hole dug into the sidewalk and in that gaping hole lay pretty yellow gas lines. 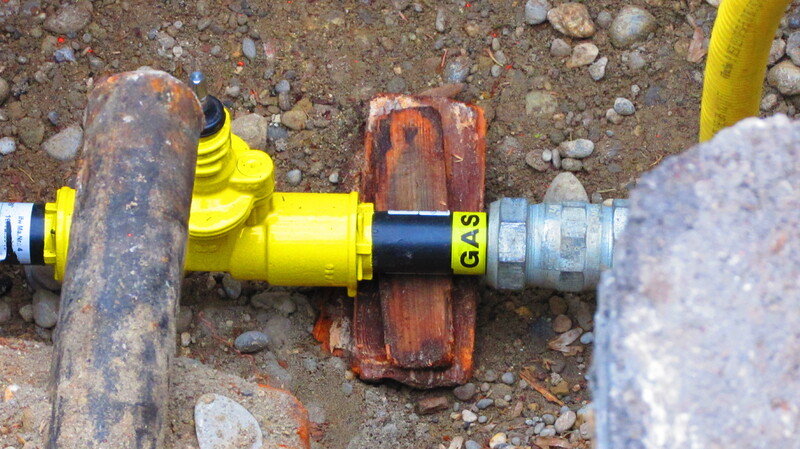 To leave a gas line exposed is another thing that Canadians are fussy about. 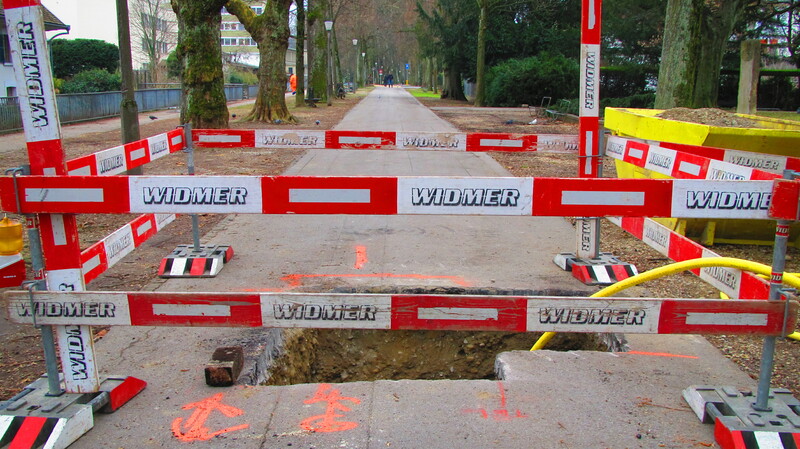 The hole has been there since January 12th, unguarded, unsealed and just unsane. No dogs or small children have plunged in, but that’s because it the workers erected rails around it, which by Swiss standards is high-security. They normally just dig holes and leave them unmarked for unwatchful walkers to fall into. Note: This post is not to suggest the Swiss are in any way lazy. They are not. As proof, the grounds keeping staff in our lakefront park have been mowing, leaf-clearing, debris-disposing, pruning and showing a degree of industry that is impressive. Maybe they’re getting the place ready as a refuge centre in the event of a natural gas explosion.